Why Chessboard peak is special ? Travellers to Son Tra Peninsula in Danang City are more often than not recommended to drop by Linh Ung Bai But Pagoda, and My Khe, Rang or Da Den beach as they are very popular. However, taking a motorbike ride up to Ban Co Peak to get a panoramic view of Danang City would be a fascinating experience. 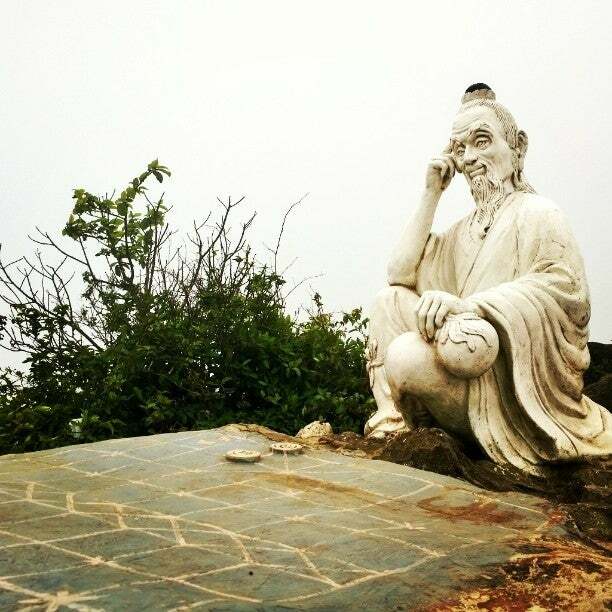 According to the legend, there were two deities sitting and playing chess on Son Tra mountain for several days but they were still inconclusive. Then one day, one of them lost the game because being distracted by fairies flew down the beach to take a shower. Out of control, he kicked the chess board into the sea and came back to heaven. Therefore, local people set up the statue of the deity who sat alone in the front of the chess board. The mountain peak’s name has also come from the legend. What to explore at Chessboard peak? The way up to the winding mountain is a journey that you can experience the beautiful and poetic landscapes of Son Tra peninsula. The sun and wind of the sea mix in a little of the wet forest trees make the journey to Ban Co peak emotional truth. From the foot to Ban Co peak, visitors can watch the entire Da Nang city with 700m-high. The cooler and foggier weather will give you exciting feelings. A busy city with buildings and nine famous bridges span Han river in your eyes. Climb to the top of Ban Co is probably the most beautiful morning dawn, when the city is still silent, the nature in the peninsula also has stirred, sunlight flickering across the mountains or in the afternoon when the sun takes off, around the peninsula cool winds to the top of the reception desk flag at sunset, trying to diffuse the sun rose from the waters, magical scenery. How to get to Chessboard peak? There's no direct bus take you to the top of Ban Co Peak. Bus route Tho Quang - Que Son will depart at Tho Quang Bus Station, from here, you can take a taxi to reach the place. For those who are adventurous, You can hire a motorbike to get there. You should bring water and extra gasoline in case you need it, as there's no stores along the road up to the peak. The best time to visit the peak is during day time, even though the place offers stunning sunset view, but it may not safe at night. You should use a good vehicle to climb the roads, and the trip will be better in the summer, the ride up is bumpy and slow. On the way down, you can take another path which runs through the forest and is safer. But be sure to ask locals about this route before you go. If you’re lucky you’ll catch glimpse of a few brown monkey wandering down the road. at C2-10 (opposite to 133) Tran Nhan Tong Street, Tho Quang ward, Son Tra District, Danang City, Vietnam.